Tools for cooking and baking for food crafters of all levels. MyKitchenCalculator.com is a free easy to use online recipe conversion resource that includes a recipe converter tool and a kitchen calculator tool. The site also allows you to access and download baking templates designed by MyKitchenCalculator.com, which can help make baking easier. The Recipe Converter was designed to easily convert recipes from one size to another. The design was centered around allowing people to copy the entire ingredients section of a recipe and pasting it into the converter rather than to enter the ingredients line by line into separate rows as other converters require. This makes our recipe converter fast and easy to use. The recipe converter also allows you to choose how you want to change the size of your recipes by allowing you to multiply, divide, scale, or change the portion size. Be sure to check out the video tutorial or the how-to section for hints on how to use this tool. 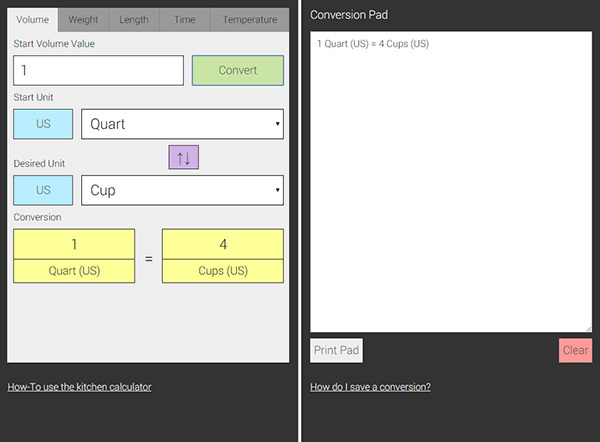 The Kitchen Calculator is a unit conversion tool that allows you to convert between the most common kitchen measurement units. The kitchen calculator allows you to convert between different units of volume, weight, length, and temperature. It allows you to enter fractions as input values and helps you keep track of your most recent conversions. Remember to bookmark this site for easy access to the tool! Get the App! The MyKitchenCalculator.com Kitchen Calculator App for Android™ was designed to work on most Android™ and Kindle mobile devices and functions without an internet connection. The app also has tools not found on this site, such as an ingredient unit converter, which allows you to convert between units of weight and volume for more than 250 ingredients! For more information about the app, visit the Kitchen Calculator Google Play™ App page, or the Kitchen Calculator Amazon App page. You can also download our FREE Tip Calculator App for Android and Kindle mobile devices, designed for version 2.3.3 and higher. For more information about the FREE Tip Calculator App, visit the Get Tipsy Free Amazon App page. The recipe converter tool can be used to help you multiply, divide, scale, or portion your recipes to a desired yield or serving size. With just a few simple steps, you can convert most recipes in a matter of seconds! It's almost as easy as copy, paste, convert! The kitchen calculator tool can be used to help you convert between the most common units used in cooking and baking. The kitchen calculator allows you to convert units such as volume, weight, length, time, and temperature. It also has a Gas Mark reference. Learn about using our baking templates. The baking templates were created to help make certain baked goods, such as cookies, more efficiently. The templates also come in different shapes, so they allow you to be creative when crafting your goodies. 11/19/2016: Added the recipe collection section to the website. 07/30/2016: Fixed an issue where fractions used in recipes from food.com were not being converted properly. 03/31/2016: Released version 4.0 update of the Kitchen Calculator Android App. 12/12/2015: Added a video tutorial on how to use the website. 07/09/2015: Updated kitchen calculator tool. 06/03/2015: Updated site to be more mobile friendly. 12/21/2014: Added Christmas themed shapes to the baking templates page. The Christmas baking templates can be found on the "Other Templates" section. 10/30/2014: Added the ## and // operators to the website's recipe converter tool. The mobile app will get this enhancement in the next update. 10/06/2014: Updated appearance of the recipe converter page. 9/11/2014: Added baking templates section to website. 7/31/2014: Updated appearance of the home page. 7/02/2014: Released version 3.3 update of the Kitchen Calculator Android app. 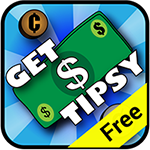 5/17/2014: Released the ad free version of the Get Tipsy Tip Calculator app for Android devices. 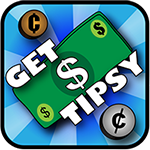 3/03/2014: Released the FREE version of the Get Tipsy Tip Calculator app for Android devices. 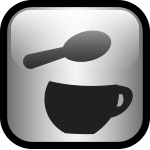 1/24/2014: Released version 3.2 update of the Kitchen Calculator Android app. 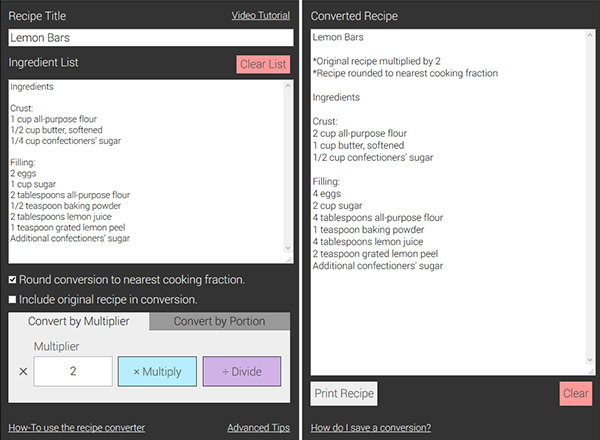 11/23/2013: Added recipe converter video tutorial. 7/15/2013: Changed volume conversions from FDA rounded values to NIST rounded values.